We held our OSU Extension Nursery, Landscape, and Turf Team (ENLTT) meeting yesterday at Dawes Arboretum. Among the beautiful landscapes and impressive collections was clear evidence that Yellow Poplar Weevils (Odontopus calceatus) had made a return appearance in central Ohio. The adults feed on leaves and the larvae feed within leaves as leafminers. Weevil populations usually rise and fall dramatically with 2 - 3 consecutive years of "outbreak" population densities followed by several years with almost no weevils observed. It would appear that parts of Ohio including the central part of the state may be experiencing the beginnings of an outbreak. This means even more weevils may rear their snouts next season. This native weevil is found throughout much of the eastern U.S. matching the native range of its namesake host, yellow poplar (Liriodendron tulipifera) (a.k.a. tulip poplar or tuliptree). Weevils may also be found on magnolias (Magnolia spp.) and sassafras (Sassafras albidum) leading to the alternate common names of sassafras weevil and magnolia leafminer. The small (2/16" long), oval-shaped weevils (order Coleoptera; family Curculionidae) range in color from black to brownish-black to reddish-brown and have deeply grooved wing covers (elytra). Although they are good flyers, the weevils often elect to fold their legs to "play dead" when disturbed; a defense strategy that is common among weevils. In the eyes of some people, yellow poplar weevils resemble ticks which may generate calls to Extension offices concerning "flying ticks" during outbreak years. Of course, ticks can't fly. Adult feeding damage appears as characteristic half-moon-shaped holes in the foliage. Numerous feeding holes can cause leaves to wilt, turn brown, and die. Heavy damage is sometimes mistaken for drought damage. Although the damage may be noticeable, it is seldom severe enough to damage the overall health of affected trees. However, small, newly planted trees may be harmed. The literature notes that the blotch-type larval leafmines are most of often found on yellow poplar; however, I've found them on the other hosts as well. The leafmining larvae feed either singly or in groups to produce large blotch mines. Although larval leafmines are noticeable, the most serious damage is caused by the adults. I had a twofer with also finding the silvery snaking handiwork produced by the Magnolia Serpentine Leafmining Caterpillar (Phyllocnistis magnoliella). Yellow poplar weevils have one generation per year; however, adults feed twice during the growing season. Adults spend the winter in protected sites such as the duff beneath trees. They emerge in the spring to feed, mate, and lay eggs in leaf midribs. This is the so-called "spring generation" of adults. The "summer generation" arises from the leafmining larvae. There are typically a greater number of adults in this generation compared to the spring generation meaning the most of the damage is done in early to mid-summer. 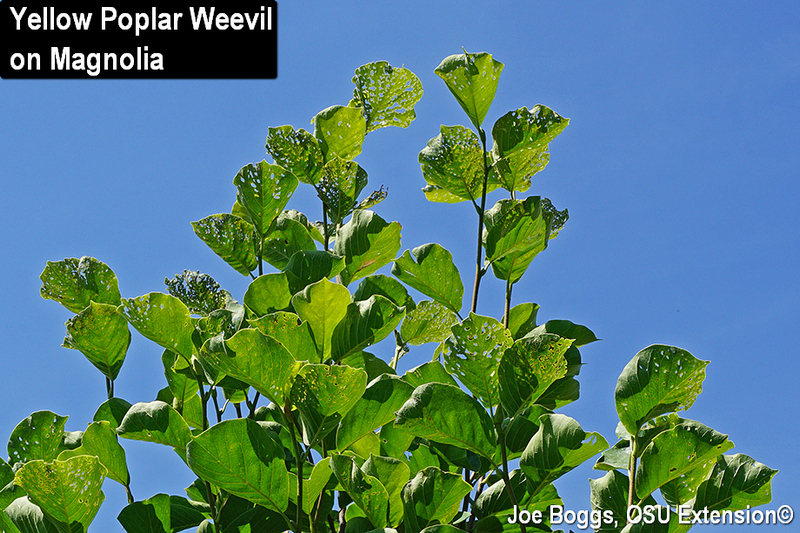 Although yellow poplar weevils are finished feeding in central Ohio, the damage will remain evident throughout season.